But keeping jewelry organized can be difficult even when you have a jewelry box. Necklaces get tangled together and your earrings get lost and covered up by all your bracelets. But how can you organize your jewelry? 1. Think vertically If you have some empty wall space, consider adding some hooks to your wall to hang up necklaces, bracelets and some of your earrings. If you do not want to attach hooks directly to your wall you could attach them to a scrap piece of wood or cork board which you can than attach to the wall. Not only will your jewelry be organized but it will also act as artwork. 2. Use an empty drawer If you have an empty dresser drawer, adding a jewelry drawer organizer can help you keep everything separated and organized. 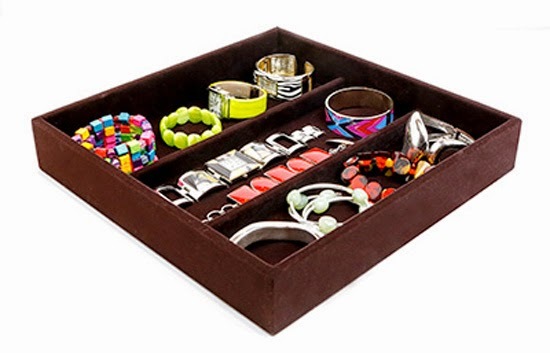 You can use multiple drawer organizers to hold your earrings, bracelets, and necklaces. Consider lining your drawer with some pretty wrapping paper or scrapbook paper to give the drawer a more finished appearance. 3. Empty counter space If you have some empty space on your dresser top or bathroom counter, you can use decorative bowls to organize your jewelry. You can place stud earrings in the bowl and hang your longer earrings off the side. The bowls would be great for holding watches and bracelets as well. You can lay your necklaces side by side in some pretty trays so they don't get tangled. Hopefully these tips have shown you that organizing your jewelry is very easy. Plus, organizing your jewelry will make it easier to see what you have and find what you need. You will also find yourself wearing your jewelry more often since it will be easy to grab what you want and put it back when you are done using it.